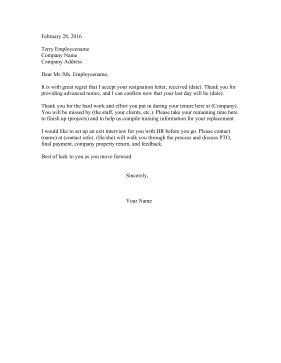 This positive letter accepts an employee's resignation and helps them transition out of the job. It is with great regret that I accept your resignation letter, received (date). Thank you for providing advanced notice, and I can confirm now that your last day will be (date). Thank you for the hard work and effort you put in during your tenure here at (Company). You will be missed by (the staff, your clients, etc.). Please take your remaining time here to finish up (projects) and to help us compile training information for your replacement. I would like to set up an exit interview for you with HR before you go. Please contact (name) at (contact info). (He/she) will walk you through the process and discuss PTO, final payment, company property return, and feedback.